Irony makes this world go ‘round and North Carolina is providing plenty of it in the form of vouchers, or as proponents call them in North Carolina, Opportunity Grants. In truth, they should be called Missed Opportunity Grants, because the money that the North Carolina General Assembly has spent and wants to spend on vouchers is literally being taken away from the traditional pubic schools who need them the most. How ironic is it that the first definition of the word “voucher” uses the word “proof” in it and there is no substantial evidence that the use of “vouchers” (refer to third definition above) actually even work well? Even without any “voucher” to “vouch” for the use of educational “vouchers”, the General Assembly seems hell-bent on expanding the Opportunity Grants program. On May 31st, Sen. Phil Berger officially rolled out the senate’s budget proposal and in it set appropriations for further funding of the Opportunity Grants, NC’s version of vouchers. The table below is from page 64 of that actual budget proposal. It asks for a %300 increase in funds by the year 2027. Add up all of the money for each pf the years and you will get a sum of nearly just under a billion dollars. A BILLION DOLLARS! Now, look at the list of eligible schools that can receive Opportunity Grants – https://www3.ncseaa.edu/cgi-bin/SCHOOLROSTER/NPS500.pgm. It ‘s a long list. But here it the first part of it. Yep, they are mostly religiously affiliated. If you look at the entire list, you will see that trend stands true throughout. Religious schools do not have to use the same curriculum. They can and have altered admission requirements (LGBT students for instance). They can teach creationism and eschew evolution. They can use their own “tests” to measure students. They can indoctrinate students based on the belief system of the school’s religious affiliation. Also, these religious schools are associated many times with non-taxed entities. And public tax money is being used to finance it. Even more ironic is that literally days before this budget was presented a study by Mark Dynarski at the Brookings Institute spoke directly to the negative effects of vouchers. A link to the study was provided by Rob Schofield of NC Policy Watch (http://pulse.ncpolicywatch.org/2016/05/31/new-study-voucher-students-doing-significantly-worse-than-public-school-counterparts/). He also highlighted the Executive Summary of Dynarski’s report and it is stirring. “Recent research on statewide voucher programs in Louisiana and Indiana has found that public school students that received vouchers to attend private schools subsequently scored lower on reading and math tests compared to similar students that remained in public schools. The magnitudes of the negative impacts were large. These studies used rigorous research designs that allow for strong causal conclusions. And they showed that the results were not explained by the particular tests that were used or the possibility that students receiving vouchers transferred out of above-average public schools. That does not vouch well for vouchers, especially since North Carolina’s program has hardly had enough time to even show results that would validate such an increase in funds in the budget proposal. It has been shown that much of the money from Opportunity Grants has been used in tuition costs for small (oftentimes religious) schools who do not have to show test results unless they garner an extremely high amount of money from the voucher system. It’s like they do not even have to show growth, the very variable that lawmakers continue to hark on for public schools. Put simply, the NCGA has created a moving and insanely difficult target for public schools to show proficiency that then creates a false need for vouchers to schools that do not even have to show any growth, a need so great that it will cost almost $900 million dollars in the next ten years to “fix”. Until vouchers can be shown to improve academic outcomes and the recipient schools show the same transparency with tax money as public schools school must, then these are not Opportunity Grants. They are missed opportunities. So what is to be done? Well, I propose the “Missed Opportunity Refunds”. It revolves around five basic principles. All schools who are willing to accept Opportunity Grants should be willing to submit an application to the state stating why an Opportunity Grant would be a good investment on the part of the state. Those schools should also disclose the tuition costs and the amount of scholarships available and it should be public. This would make them eligible to receive an Opportunity Grant. However, by the same token, they would now be responsible for a Missed Opportunity Refund. Missed Opportunity Refunds would be financed by the very private schools that receive Opportunity Grant money that fail to show gains in reading and math standardized tests that public schools are forced to measure students with. The Missed Opportunity Refund would go to the public school that the student would have naturally attended. When a Missed Opportunity Refund is given back to a public school, the state will have to also pay another $4,200 to the school to help make sure that the student make up for the digression in academic achievement. That money would come out of the budget for Opportunity Grants established by the NCGA. All schools that receive Opportunity Grants have to be on a registry, like the one alluded to earlier – https://www3.ncseaa.edu/cgi-bin/SCHOOLROSTER/NPS500.pgm. But now there would be a new registry kept by the state that would show how many “refunds” had to be given back to public schools and it would be accessible to the public. If a school has to give back a certain number of Missed Opportunity Refunds, then that school no longer is eligible to receive Opportunity Grants at all. When the chance or occasion or prospect arises to spend money on a student to be more successful in a school, then does it not make sense to spend money helping ensure that all students become more successful in school? And we already have that opportunity – by fully funding our public schools. You tell students that the shorts you wore when you played basketball were really shorts. When you become a public school teacher there are sets of rules and dictates you must abide by. There are laws. There are procedures. There are decrees. There are edicts. There is protocol. When parents, students, voters, taxpayers, government officials, post-secondary institutions, and employers all have some sort of stake in the public education system, there are expectations involved, whether they are clearly defined or even obtainable. In an election year like this one here in North Carolina, we are seeing an onslaught of “re-forming” efforts aimed at redefining public education that twenty years ago could not have been expected. Testing, mandates, evaluation systems, salary “adjustments”, due-process removal, vouchers, charters, and lack of support have made the road to teaching and learning an uphill climb on an unnavigable path constantly being obstructed by those who view public schools from the outside. And there are still those expectations. Yet there are the expectations that great teachers place on themselves. The teachers that I admire the most, the ones in whose classes I want my own kids to matriculate through, and the ones I try to emulate all abide by a set of expectations that define how they approach teaching the whole student. Maybe you could define them as rules, laws, procedures, decrees, edicts, or whatever, but they define how master teachers view their profession. And while they are unwritten, they are clearly etched in their actions and words. Furthermore, they help define the human aspect of the student/teacher relationship – the most important dynamic in the schooling. Great teachers teach every child as if he/she can learn if given the right opportunities and the right instruction. Great teachers teach every child in class no matter what religious creed he/she abides by and even those students who claim no religion or claim there is no god. Great teachers teach every child in class no matter what sexual orientation or identity he/she has. A transgender student is as valued a member of my class as the star athlete. Great teachers teach every child in class no matter what his/her family’s income is. Great teachers teach every child in my class no matter what their nuclear family looks like or how they define themselves. Great teachers teach every child in class no matter if his/her belief system is different than theirs, whether political, social, or religious. Great teachers celebrate a student’s academic and personal growth. Great teachers intercede on behalf of students to administration and guidance if they believe there is something else that can be done to help the student succeed. Great teachers celebrate a student’s personal achievements outside of the classroom. Great teachers listen to a student when he or she has a problem that affects his or her ability to learn. Then I will act on that information with the student’s best interest in mind. But there are things that students must do as well. If not, the student/teacher relationship breaks down. Students must be willing to learn and put forth the effort to succeed. Students must be willing to advocate for themselves and ask questions when needed. They must seek opportunities to be tutored and get extra help if needed. Students must be willing to let teachers and administrators know if there are obstacles in their way. Students must show up physically and mentally. 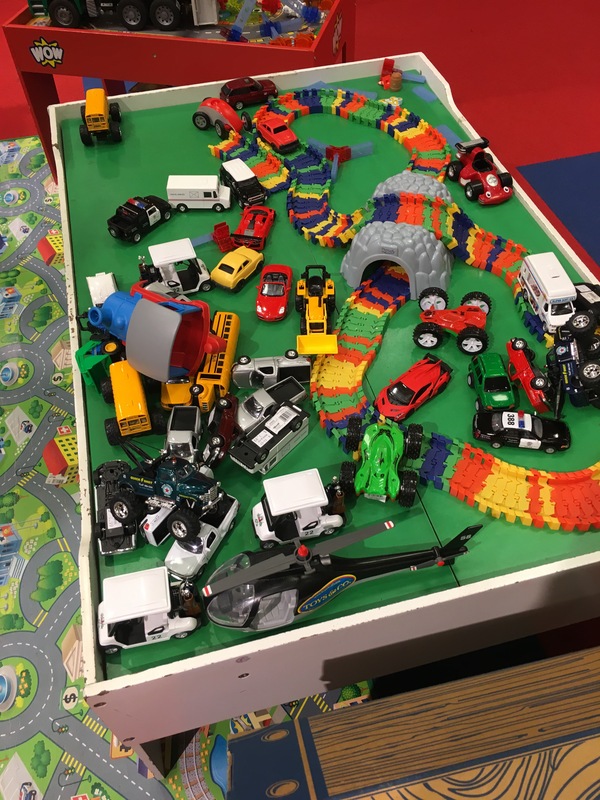 Now, if the government spent more time removing obstacles that would allow for the student/teacher relationship to remain central in schooling and spent more resources outfitting the needs that schools identify, then there would be no talk of whether public school were meeting expectations. In fact, we would be busy setting even higher ones. But if the current climate of public schooling here in North Carolina remains as it is, we will lose those great teachers. And we need them now more than ever. 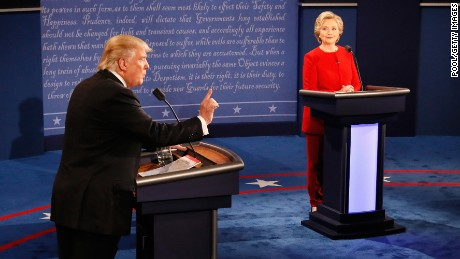 The first debate between Donald Trump and Hillary Clinton at Hofstra University proved to be more than a ratings sweep for the three major networks and news channels. To be exact, I mean “semi-exact,” it was pure entertainment. And a fantastic study of body language. 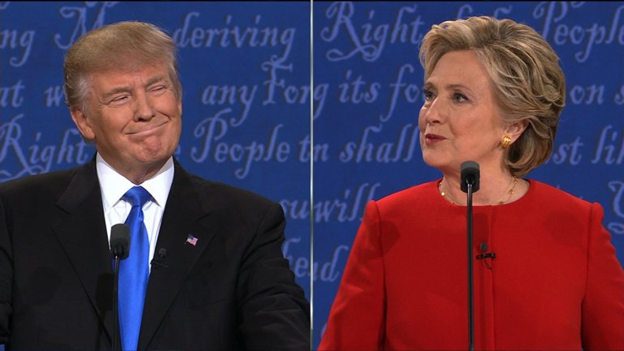 You can watch the debate over again and decide for yourself, but I would suggest watching it again without volume. You will see just how loud body language can be because it speaks volumes. Just take a look at the following pictures. These are just pictures. Imagine them occurring in real time. To see both candidates on the screen simultaneously with the use of a split screen is a fantastic perspective. It allows you to see how another person is reacting to another’s words. And yes, I understand that I am not even showing Hillary Clinton. That’s because there was not much of a focus on her after people were picking up on the sniffing, parched, and histrionic Trump. 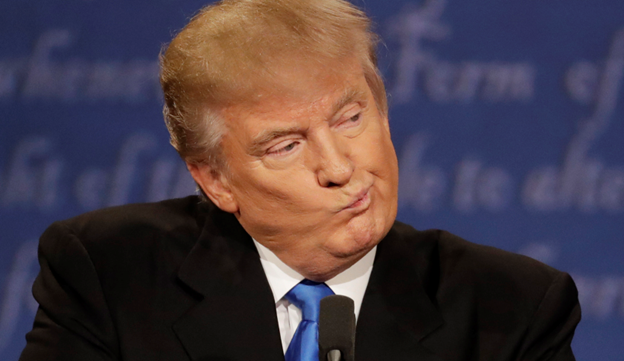 What he was doing when he wasn’t speaking was just as entertaining as listening to him talk. 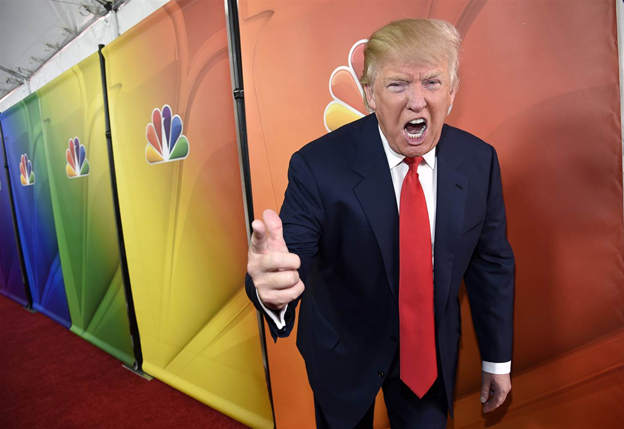 Ironically, he looked and acted the same way as he did when he was on his NBC show, The Apprentice. 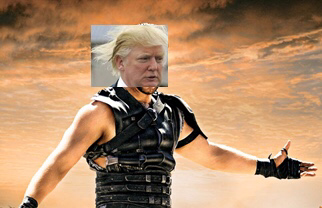 Thank you Maximus Decimus Meridias Trump. I was thoroughly entertained. These famous lines from what I consider the greatest narrative poem in the English language (and the most haunting) are a perfect example of the sadistic nature of irony that surrounds us. 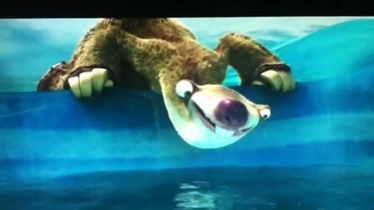 Sid then swallows a heaping amount of salty sea water making his face shrivel up like someone who chases down alum with lemon juice. And then there is that not well-known, but pertinent rhyme from the GOP camp used by dehydrated, parched, hyperarid, sunbaked, xerothermic candidates for national office. Actually we do notice. Take Paul Ryan for instance. 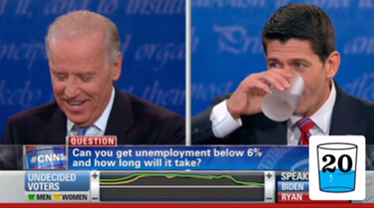 In Paul Ryan’s debate with Joe Biden during the campaign for the 2012 election, he reached for H2O well over 20 times. So semi-disturbing was this need to quench his nervous thirst that it was lampooned by Saturday Night Live to the nth degree. 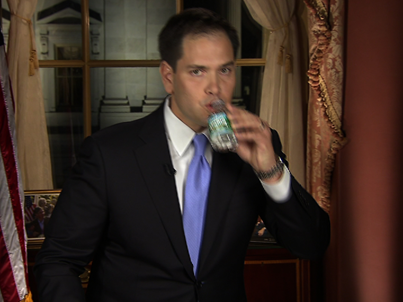 Then there was the Marco Rubio reach for the water bottle. 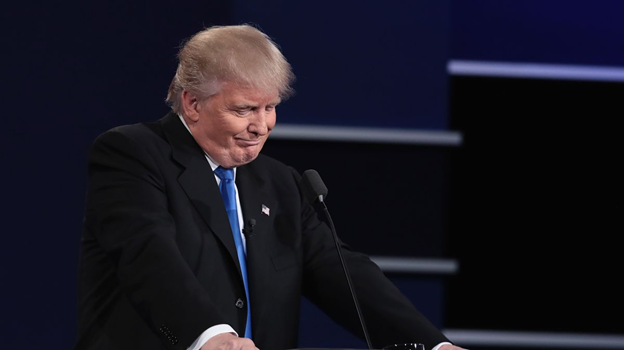 But it was Donald Trump who went to the canteen so many times during his debate with Hillary Clinton that seems to have caught my attention. 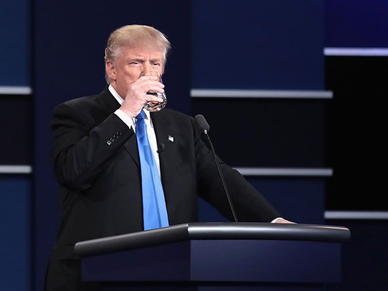 Not once did Clinton drink water on the stage. 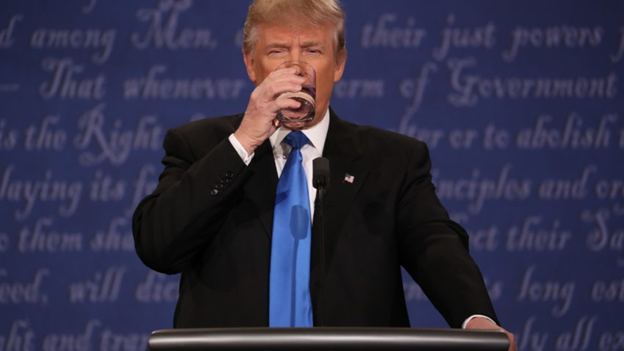 Along with copious amounts of sniffing, Donald sought to hydrate himself so many times that it was becoming an important subplot in the narrative of the debate. 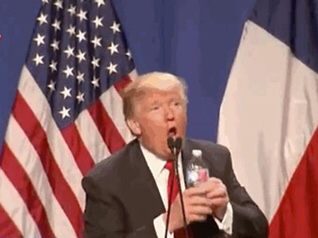 Even more thirst provoking is that he made so much fun at the expense of Marco Rubio’s need to reach for the water bottle when both were seeking the nomination for the GOP. 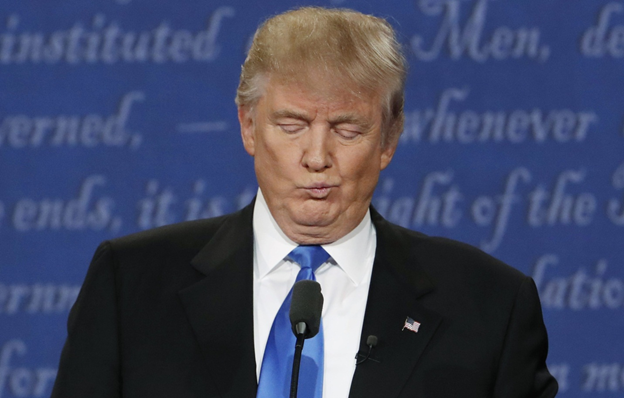 You can literally refresh yourself and your memory of that mocking scene by visiting http://www.businessinsider.com/donald-trump-marco-rubio-water-bottle-2016-2. Some will say that drinking water continuously may be the sign of a nervous habit. Some say that the temperature may have caused a need to hydrate. Some may say that Clinton didn’t drink water because she’s not human. Or it may just be a way to keep the BS from caking in his mouth, clogging up his ability to breath, and ultimately chocking him to death. It was a promotional stunt for another Trump product that is sure to be YUGE!!! That’s may not just be any water. 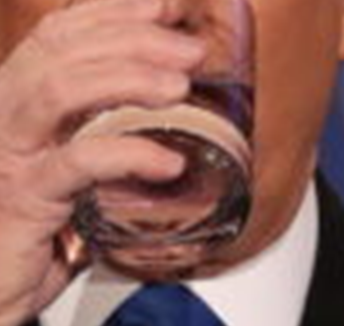 That’s Trump Water! 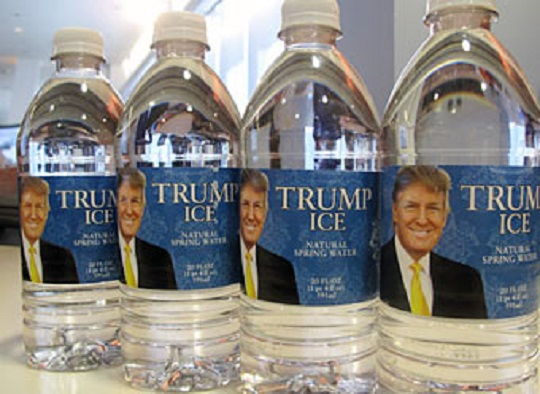 Actually it’s Trump Ice. No, I’m not kidding. It exists. 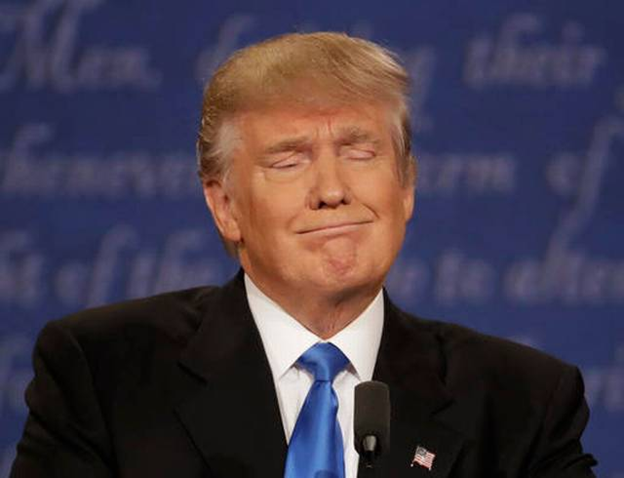 Trump Ice, I am told by an unreliable source, is distilled in a golden dome with the heat from nonexistent global warming then infused with small gold flakes and three drops per liter of Donald Trump’s sweat and one drop of crocodile tears and bottled immediately for maximum quality. Or maybe it wasn’t water at all. Maybe it was another clear liquid designed to change how you do not perceive reality. 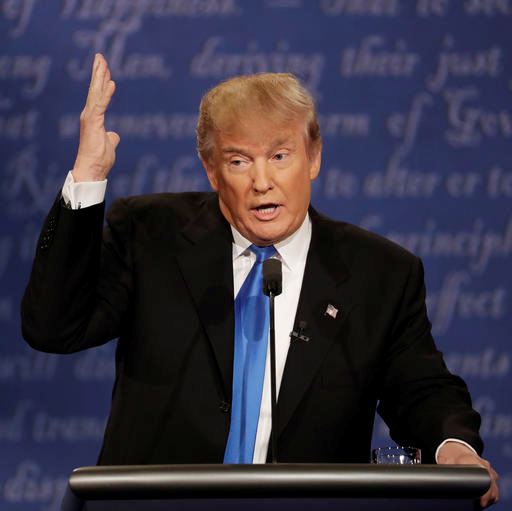 The more “water” Trump drank the more he exhibited the unique ability to avoid questions with repetitive answers that hurl invectives and disperse rage like none other. That’s right! 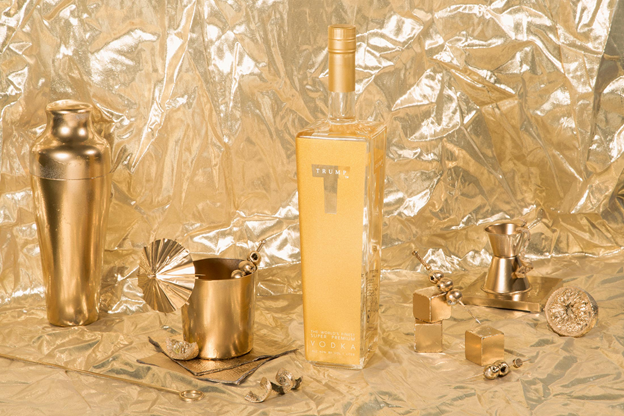 Trump Vodka. It also exists – at least at one time. Apparently there are plenty of bottles left at Trump’s estate. Imagine if Ryan or Rubio had Trump vodka in their systems rather than just plain water. 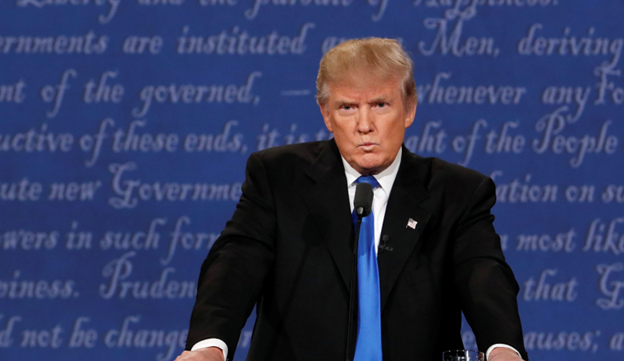 Joe Biden would not have stood a chance. And Rubio may not have been standing at all by the end of his address. 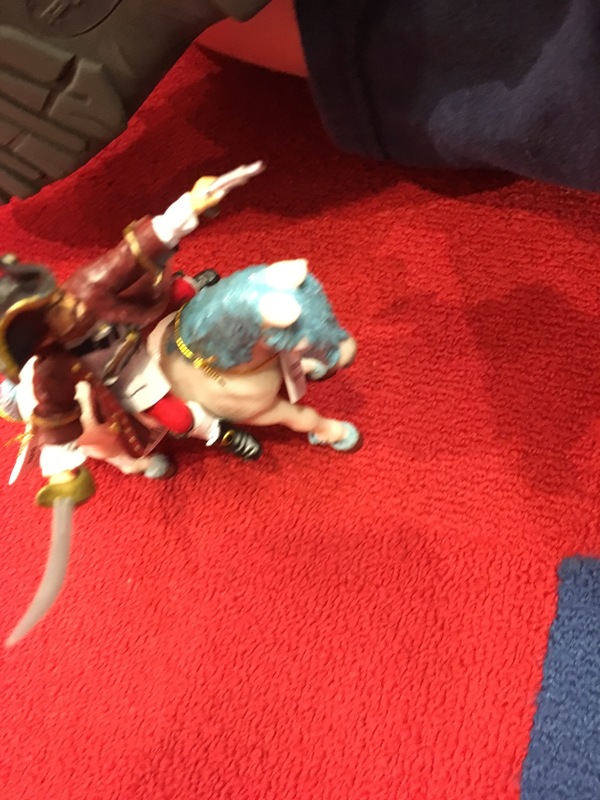 We go to the toy store, play with the toys, and see what Malcolm likes to play with for gift ideas. You may think it is just to pass time. It’s not. It is rather deliberate. His mom and I need him working with things that he can manipulate, work mentally on, and create things with to keep him growing mentally, physically, emotionally, and most of all socially. 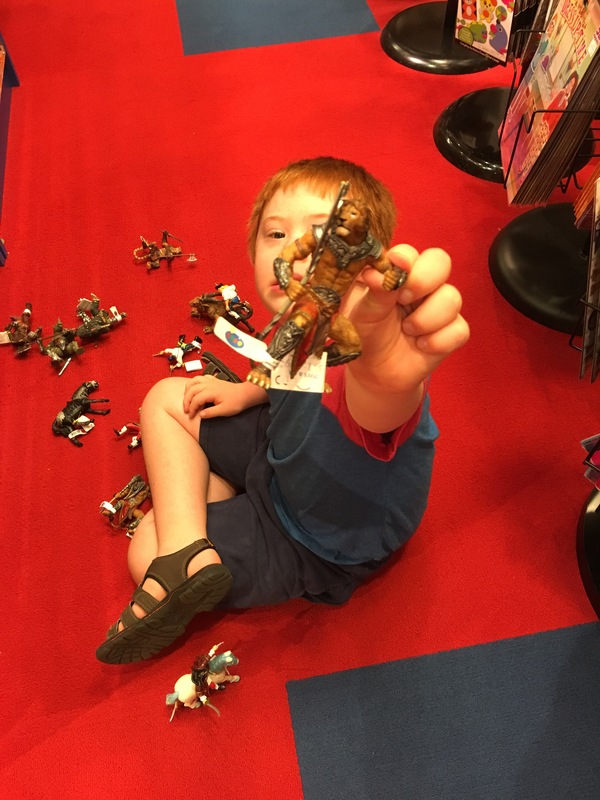 In a toy store, he is another kid who is not different because he has an extra chromosome, but because he likes to play. And I love to watch his imagination work, flow, gel, and create is a thing of beauty. He has something that a lot of us have thrown to the wayside – the ability to be in the moment. 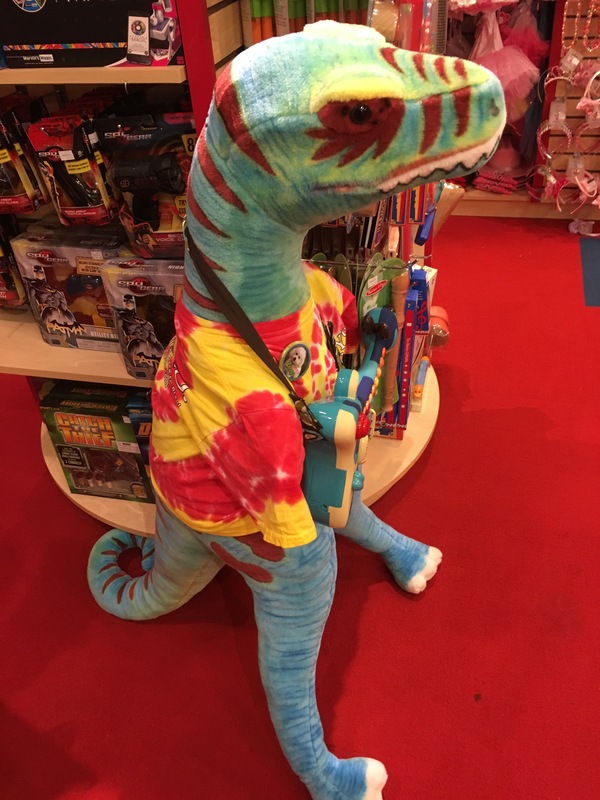 First there is this huge T-Rex stuffed animal. I may be getting that for Laura. She rather likes a coelurosaurian theropod dinosaur with very short arms. 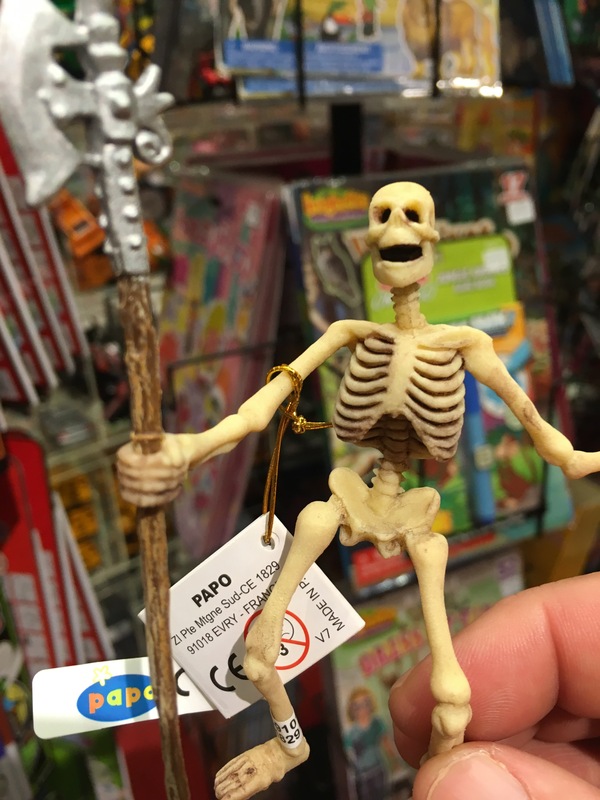 In fact, if you see a statue of one on sale, let me know. We want one in the front yard just to have and maybe dress up for all of the major holidays. 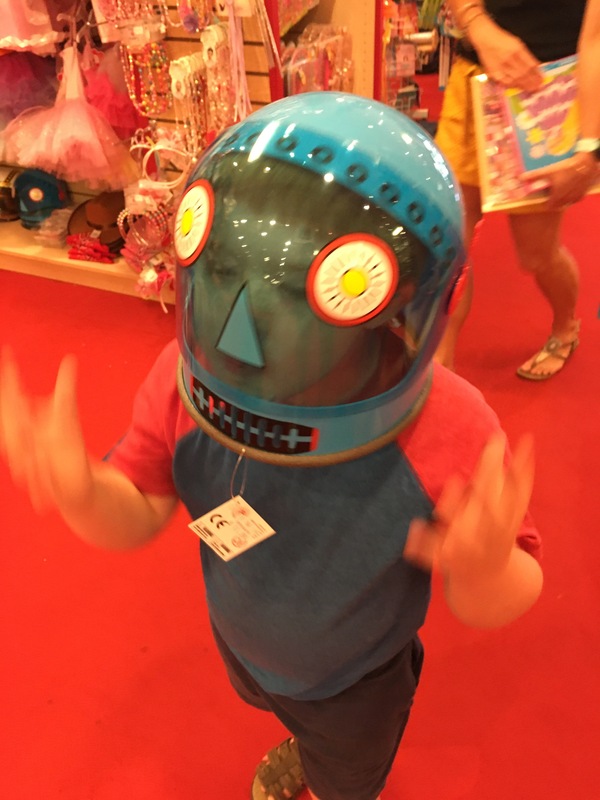 The there was Space Alien Man! 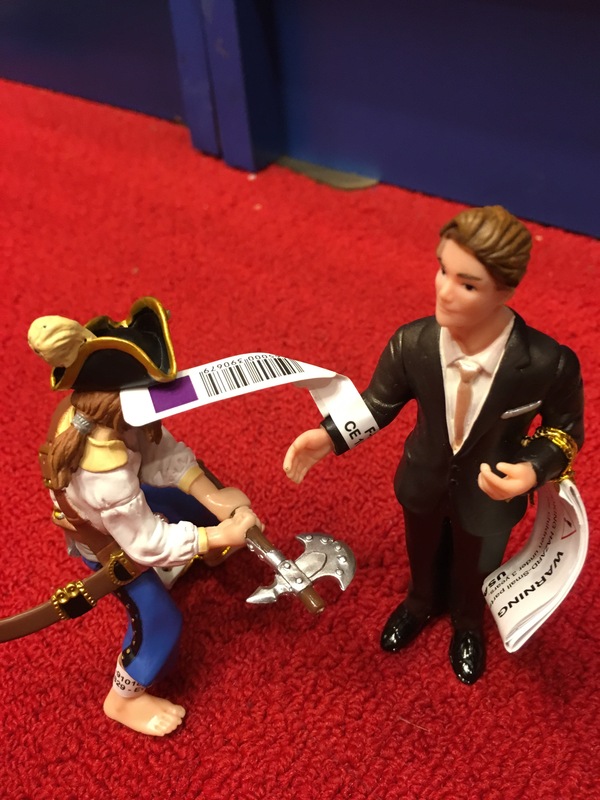 And then he settled down into the aisle with figurines – he same aisle that produced the legendary pirate on unicorns from way back. They can still be found. 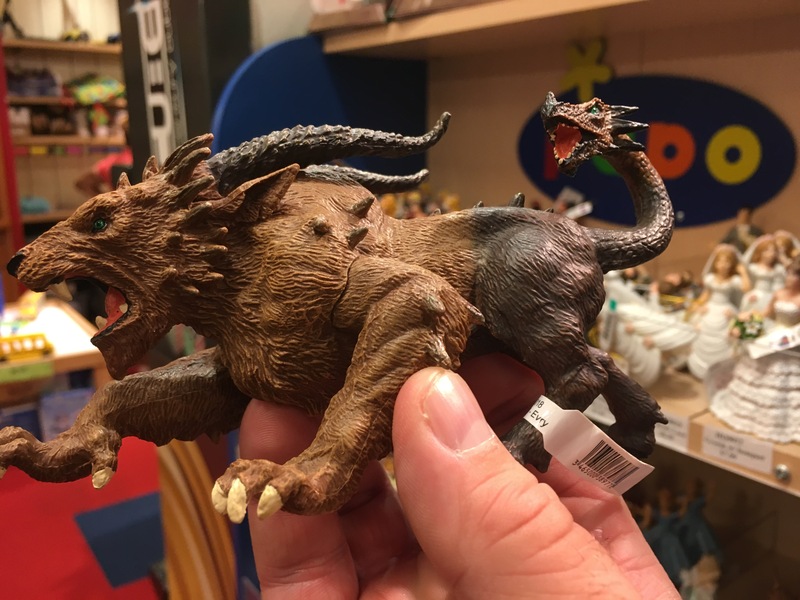 And then he finds it – LION MAN! 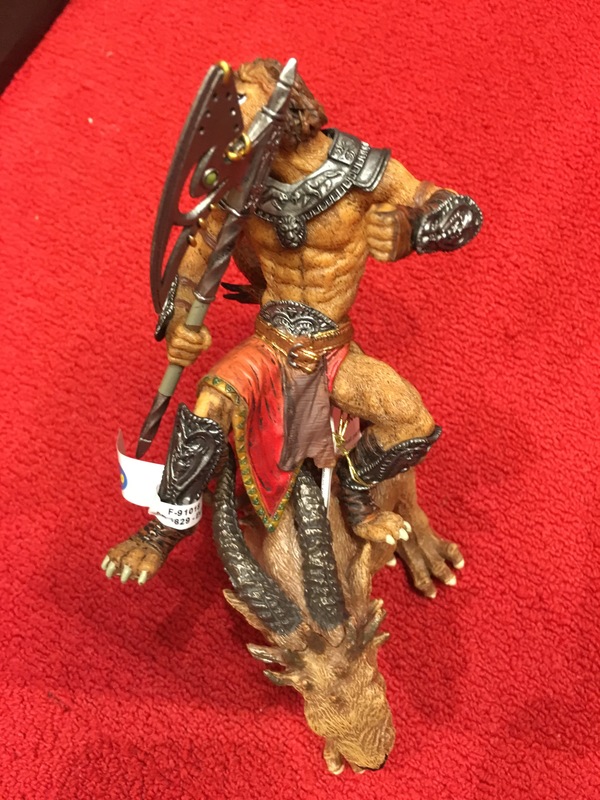 And who better than BATTLE YAK to carry LION MAN and begin to defeat the forces of evil! 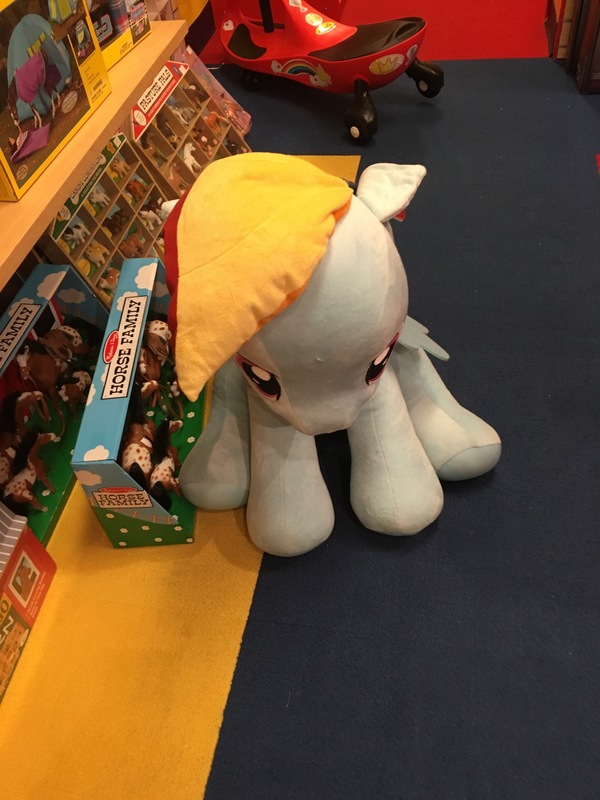 And keep Donald Trump from taking over the toy store? Good Battle Yak. Good Battle Yak. 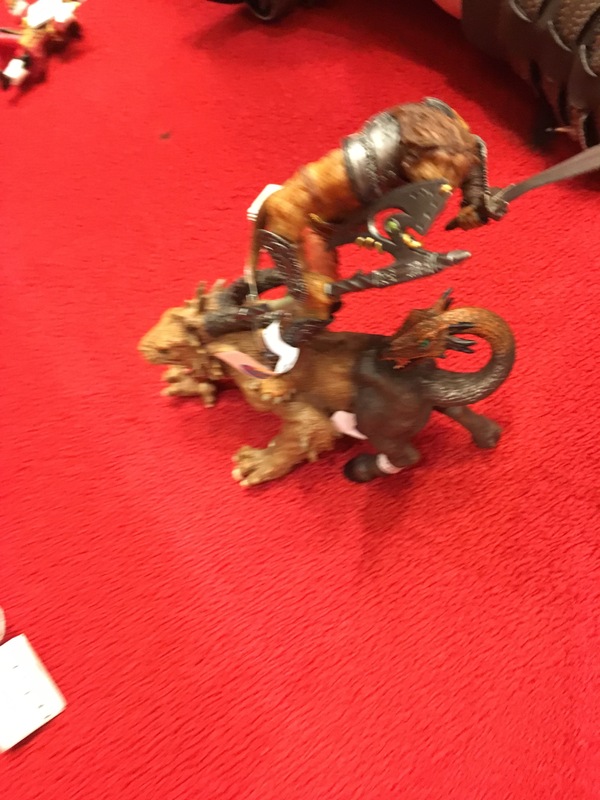 After a long day of saving endless situations from destroying the earth, Malcolm and I do the only thing deserving of monumental feats as Lion Man and Battle Yak have done. It’s right across the street from the toy store. And we talk about the day as men do. In the summer of 1988, I was at the family farm in northeast Georgia feeding calves in a shelter located behind my uncle’s veterinary clinic. I entered the doorway and immediately was greeted by a red wasp who took a small divet out of the tip of my nose while injecting its venom. I immediately went into anaphylactic shock. My eyes were literally swelling up to the point that I couldn’t see straight. Luckily someone called ahead and because it was a small town (3,500 people), there was not much of a drive to “downtown” where the doctor was waiting for me. He drove a large needle into my thigh and told me to sit down and wait to see if I had any reactions to the medicine that he gave me for having an allergic reaction to a wasp sting. My face had swollen up so much that I had a hard time even closing my lips together. For the next month, I looked as if I had barely escaped a bar room brawl with my life. So began a life married to EpiPens. You have to replace them regularly. Their shelf life lasts maybe a little of over a year. And in the space of maybe three to four years, the price of this drug, which has no generic, has skyrocketed almost %500. Any food allergy can cause anaphylactic shock which requires the use of an EpiPen. That’s about 15 million people, many of whom attend public schools. The company that owns the market on EpiPens is Mylan, whose price gouging of the life preserving drug has become the subject of a government inquiry. The CEO of Mylan, Heather Bresch, has defended the price hike as a necessary move within the business world, part of which is a compensation package for her and other executives that has grown faster than the price of EpiPens themselves. It’s business world setting the price standard and availability for a necessary, life-preserving product that many cannot afford now. There’s a strong correlation to what is happening to the people who need EpiPens and those who need public schools to be supported and fully funded by tax payer money. How so? When business style corporate reform movements ventured into the world of public education here in North Carolina in the form of unregulated charter schools and veiled vouchers schemes, many students and their families were submitted to a form of “educational” anaphylactic shock. The very education that is constitutionally stipulated for every student by the state through public schooling was now being controlled by entities like a Mylan. Think of the Achievement School District. Think of charter schools that claim to be public, but run privately. Think of the virtual online schools run by for-profit companies. Think of all of the tests and assessment initiatives contracted out by the state. In truth, all of society is allergic to “educational” anaphylactic shock. When public schools are not supported adequately, society suffers from a narrowing of societal pathways, a loss in collective blood pressure, and an outbreak that distorts the appearance of our state. We all suffer from that. Now think of the very remedies that help to offset conditions that could lead to “educational” anaphylactic shock – teachers and support staff like teacher assistants. That’s right. Teachers and staff are the adrenaline that keep the pulse of public education strong, especially in times of social change. And just like Mylan is doing with EpiPens, our state government is allowing people to do the same with our teachers – making it more expensive to keep them in our schools for all of our students. While the price of making an EpiPen has not really changed at all, the desire for profit at the expense of those who really need EpiPens has outweighed the call to provide a necessary service to help people stay alive. Likewise, as the expenditure of training, resourcing, and respecting the teachers of public schools has been driven down, the desire for profit using tax payer money has grown, like the price of EpiPens. And what makes this more egregious is that the state of North Carolina is obligated to fully fund and resource public schools along with help from federal and local monies. It will be more expensive to carry on with “re-forming” efforts like unregulated charter schools and Opportunity Grants (vouchers) in the long run, than to fully support public schools, especially in poverty stricken counties. Ironically, Mylan CEO Heather Bresch is the daughter of Sen. Joe Manchin, D-West Virginia. He has defended her actions under the light of scrutiny as legal business practices. Maybe it would make sense to investigate the relationships between those who profit from public educational “re-forms” and those in state government who allow for them to happen at the expense of people who will be sent into “educational” anaphylactic shock because of them. Remember, we are all allergic to under-funded public schools. “Because Every Second Counts” – just like the package for EpiPens says. The above is a quote from a man named Tim Peck, a self-described “Unaffiliated Objectivist” and writer of the blog Et in Arcadia ego. He also is a prolific Twitter tweeter, who according to Rob Schofield of NC Policy Watch is “one of the most prolific conservative voices on Twitter when it comes to North Carolina policy and politics (he’s authored more than 33,000 “tweets” in recent years that often echo and promote takes of various Art Pope Empire employees)” (http://www.ncpolicywatch.com/2016/09/13/an-election-year-switcheroo-on-public-education/). In that same article, Schofield outlines the electioneering, pro-teacher stance that the GOP powers in NC have adopted this year in order to portray themselves as the friends of public education. And that’s when I came across Tim Peck’s Twitter tweet (I still like the alliterative sound there – almost tongue-twisting). Put aside that Mr. Peck’s unaffiliated objectivism seems to hearken to Ayn Rand’s philosophical system. I am not really interested in debating the merits of ideas expounded upon in Atlas Shrugged or The Fountainhead. Put aside that Mr. Peck’s blog (Et in Arcadia ego ) is named after a phrase that praises the idyllic pastoral life of ancient Arcadia where inhabitants lived simply away from corrupted city life. There are not many people who can actually claim to be securely sequestered by the issues that affect North Carolinians. Put aside that the phrase “et in Arcadia ego” is also used by Virgil in the “Eclogues”. This posting is not questioning the use of a phrase by a poet who wrote Rome’s greatest epic poem that asserted the almost “divine” nature of Augustus Caesar and spotlighted Rome as the beacon of civilization when it was anything but pastoral in nature. 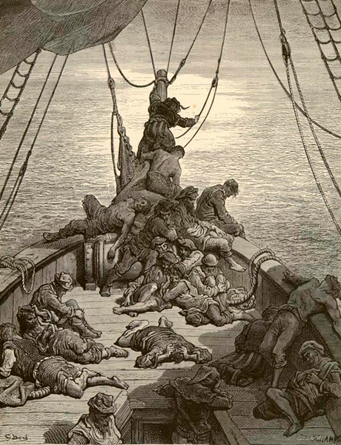 Put aside that the featured image of Mr. Peck’s blog, “Wanderer Above the Fog” by Caspar David Friedrich, is often associated with Lord (George Gordon) Byron, the famous British Romantic poet and writer of Childe Harold’s Pilgrimage, whose personal life philosophy seems to run totally counter to the views of Ayn Rand. And I have to admit that it is a good question offered by Mr. Twitter Tweet Tim Peck. Good question. I assume he is referring to teachers. But I am willing to give the benefit of the doubt here. I will say that we really need to find the market rate of the degree-holding babysitter and flush this argument out. I’m a public school teacher; therefore, by Mr. Peck’s Twitter tweet, I am also an unaccountable degree-holding babysitter. And I will save the accountability portion of his tweet for a later date. As far as baby-sitting goes, I just need to keep the kids occupied, fed, clothed, and let them play without destroying personal property. For zip code, I used an Asheville code. That’s where Mr. Peck resides. You know, I will give a markdown. Call it the “unaccountability discount” as Mr. Peck seems to think teachers are unaccountable. Half off! That makes the hourly rate $63.00. Now, I work on average about 10 hours a school day. Multiplying the new rate ($63.00) by 10 hours and I get a rate of $630 a day. Holy cow! Mr. Peck, I am starting to like your new implied idea of recompense for us babysitters. My contract stipulates that I teach kids 180 days a year. So my new daily rate ($630) multiplied by the number of contracted days (and if I read your blog correctly, you like for public work to be contracted out), my “yearly” haul to babysit would be $113,400 for the school year. So, let’s go back to the original question that you posed in your level-headed tweet. Well done, Tim Peck. Well done. What follows is the text of a post I wrote about a year ago concerning the very same thing happening in Texas. This might be one of the most horrific things that I have ever read concerning how a state’s public education system handles its special education initiatives. It comes from the Houston Chronicle. It is entitled “Denied: How Texas keeps tens of thousands of children out of special education”. It is written by Brian M. Rosenthal. It’s the worst fear for a parent of a child with special needs. And I want you to read it. All of it. And yes, it’s long. But it is one of the best pieces of journalistic investigation I have ever come across. Here it is – http://www.houstonchronicle.com/denied/. I am a parent of a child with special needs, specifically Down Syndrome and I could not even imagine what these parents may be going through because the state of Texas put a price tag on their students and then swept them under a bureaucratic rug. This is the state that gave us No Child Left Behind. This is the state that literally rules what goes into textbooks for a greater portion of the middle section of the country. This is the state that came to North Carolina and recruited teachers knowing that salary was a big issue for our teachers. And I can’t help but think is this happening in other states?